He was playing at the Budapest Congress last night, along with the Copper Bottom Band, each of whom is worth seeing in their own right. And he was bloody brilliant. From my first-row-balcony vantage point, the place looked full – I couldn’t spot one empty seat and I wondered, as Laurie did, whether people came expecting to see Dr House. As he said himself, we had to wondering what to expect, given that until recently, he was an actor. And how comforting would it be if an airline pilot welcomed us on board by saying that until recently, they’d been a dental hygienist. But he promised we were in safe hands and he was right. Kicking off with Cmon baby, let the good times roll, it was a joy from start to finish. That Laurie has a deep love for the Blues is obvious. He speaks of James Waynes, Kansas Joe McCoy, Jelly Roll Morton, and Bessie Smith in hallowed tones. He introduces their songs with respect and feeling. Each and every member of the band had their moments of glory. Vince Henry (sax and clarinet) and Elizabeth Lea (on trombone) were out of this world. It’s not the Hugh Laurie Show. It’s not about ego or fame or stage time. It’s simply about the music. To see Laurie visibly moved as Jean McClain sang I hate a man like you was something else. For me, one of my favourites last night was his rendition of Randy Newman’s Louisiana 1927. But it was beaten for top place by his version of Louis Armstrong’s St James’s Infirmary. How can one man have so much talent? Yes, there were better singers on the stage, but if he sounded a little thin at times, he more than made up for it with passion and his enviable ability to relate so well with his audience. He did what I’ve never seen before in my seven years of major music in Budapest – he got everyone up dancing, and kept them there. Pensioners and teens alike. All sorts of everyone. When the band stopped for a quick one, on stage, he drank to our health and paid homage to those who came to listen because, as he said, songs live and breathe and have meaning because people listen. Laurie danced the tango with Guatemalan-American co-singer, Gaby Moreno, during a reworking of the Argentinian El Choclo which they pitched alongside Louis Armstrong’s Kiss of Fire. He sang with the boys in front of what looked like a vintage mic that made it sound as if we were listening to them on an old radio. The stage was set like a living room with standard lamps and rugs and even a picture of Queen Victoria. It was like being in his living room. 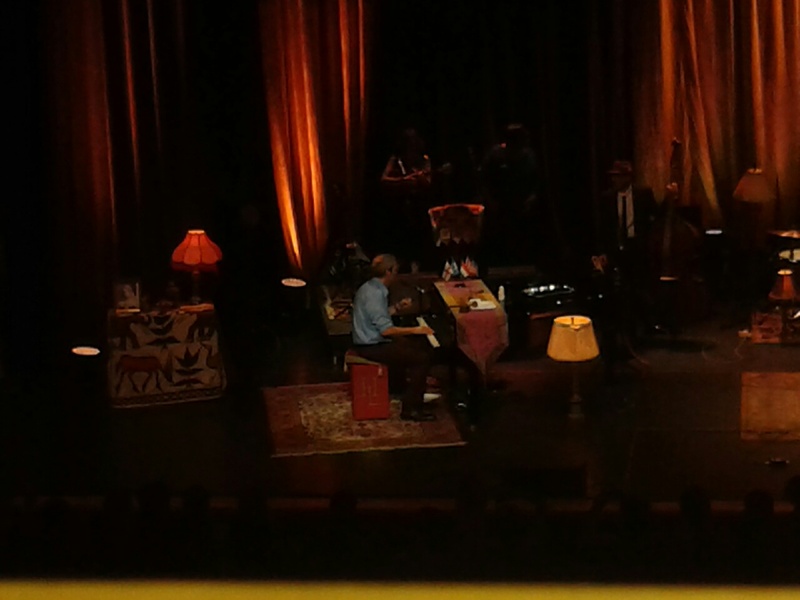 As he loped across the stage, made faces, and folded himself into his piano, it was obvious that he was playing, not only for us, but for himself. The entire band was having a blast. The mutual respect between each of them was palpable. And their acknowledgement of each others job well done was refreshing. His second of three encores, Alan Price’s Changes, had me on the verge of tears and ready to promise undying love and a lifetime of darning, if only he’d asked. It was more than a concert – it was an education. I left feeling grateful that I am now far richer in my knowledge of the Blues, and in my appreciation for the old stuff. I am grateful that I got to spend the evening in the company of a gentleman. It was a privilege indeed Mr Laurie – thank you. And thanks to the gorgeous MI&MM for the tickets! You’re angels. Having seen bits of various concerts on this tour and having been to the one in Budapest, it’s clear that Laurie, like Leonard Cohen and others, uses the same patter at each one. Same jokes, asides, anecdotes, with some variation on pretty much the same theme. That he keeps it fresh is a sign of his professionalism and his passion for the material. Had I not read other reviews, I’d have been none the wiser. Excellent full 10th concert in Prague 26 July 2013…. Very cool!